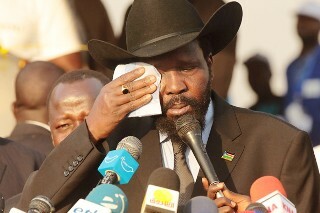 South Sudan President Salva Kiir, visibly shaken over the assassination of Kuol Deng Kuol. South Sudan President Salva Kiir Mayardit accused the government of Sudan of killing the paramount chief of the disputed border region of Abyei, Kuol Deng Kuol. Kuol, the chief of the nine Dinka Ngok chiefdoms, was travelling in a UN convoy. The convoy had just came from visiting an area in the north meeting with officials about oil production on 5 May when armed members of the Misseriya tribe (an Arab nomadic group who also lay claim to the area) attacked the convoy. An Abyei referendum was initially scheduled for January 2011 and was due to decide the fate of the area. But disagreements between the political heads of Sudan and South Sudan over who was eligible to participate has led to a stalemate.The African Union tried to break the deadlock last year, proposing that the referendum go ahead in October 2013, leaving the Southern-aligned Dinka Ngok free to vote in favour of joining South Sudan. President Kiir said the murder of the Abyei chief was a clear ploy to prevent the Dinka Ngok from voting for the area to be moved back into what is now the independent Republic of South Sudan.